OK, so this kind of product might not be high on the wish list of every mums. But it's one of those things that once tried = don't want to do without. Who knew that if you used a warm wipe to change your baby out of their TotsBots Easy Fit nappy on the Rosie & Romeo changing mat whilst wearing the divine Kicsi baby gown that your baby would be soothed rather than startled into a midnight screaming fit? Well it is true! 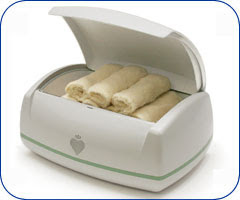 The blurb behind the Warmies Wipes Warmer is that the warm wipes opens babies pores for a cleaner more natural clean - so making nappy changing more hygenic. This new version comes with supersoft washable bamboo wipes. Making it even better. If you are looking for a gift for a pal with a new baby, then this wouldn't be a bad choice. 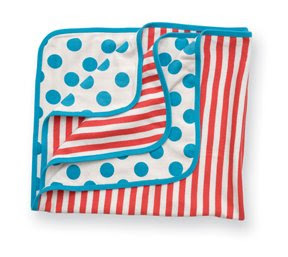 Rosie & Romeo have a really cool range of baby gear - all handcrafted from cute retro fabrics. 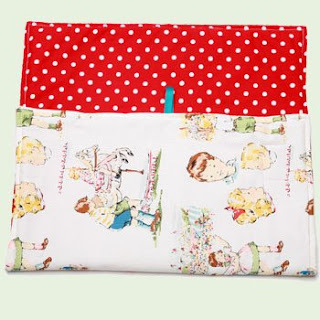 They have lots of different bits and bobs in their collection but I just love these fabric changing mats. To be honest, what isn't to like? Fabric versus plastic... i know which way I would go. Sticking with our changing theme for Real Nappy Week. 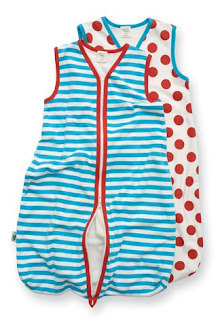 I'm bringing you a really cute sleep gown from Kicsi baby wear. I used baby gowns for all of my babies and they are the one thing that I always recommend to new mums. They make night time changes soo much easier as you don't have to fiddle with babygrow poppers in the dark - and in the depths of sleep depravation. In fact if you are gentle with your baby, you can manage the whole nappy change without them even waking up. For babies from birth to six months they come with integral scratch mitts. As it is the start of Real Nappy week - i am going to bring you a full week of nappy and changing related stuff. So lets kick off with these fab Easy Fit all in one nappies from TotsBots. They are their newest nappy and I must say that they are pretty fab. The all in one design means that even the most un-reluctant of real nappy users don't have an argument as they are as easy to use as a disposable. They are also a one size fits all - which means that you don't have to buy bigger nappies as your baby grows - saving you even more money. They come in all of TotsBots signature bright designs and in a choice of their Bamboozle or Fluffle fabrics. I think that they are the best nappy that I have seen in a long long time. £14.99 for a single nappy. Green Baby have really stepped it up a gear this season. Their baby basics are so cute that I could scream about them from the roof tops! It's times like these that you truly want a new baby and a new nursery to decorate. These fab blankets and 1 tog summer sleeping bags are both made from 100% organic cotton and would look divine on the SIBIS cot that I mentioned yesterday. If you are looking for a true piece of designer style for your baby then this is a great place to begin. 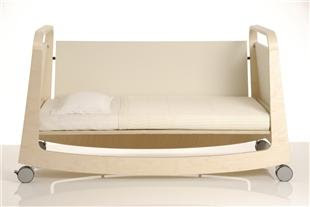 SIBIs Suiko is a convertible cot bed that starts out as a rocking crib for your newborn but transforms as baby grows. Made from birch plywood with side panels of synthetic leather - it really is very pleasing on the eye - and easy to clean too. The sides and wheels can be detached and the height of the base can be altered too, which means that if you want baby close by you can place it at the side of your bed - giving you safe and easy access at night. I have been following this whole chemicals in baby bottles story for around eight years now. The US and Canada have both called for a ban on the use of it in baby bottles - but it seems that here in the UK it is OK for us to potentially poison our babies. Prince Lionheart, known for their fantastic Slumber Bear have just launched these really cool Silicone bottles. They are free from BPA and all the other nasty chemicals associated with traditional bottle production but the best thing about them is that they are squidgy! 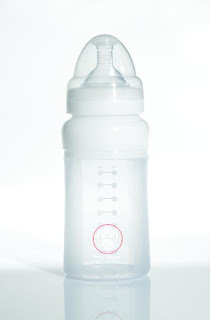 the silicone is soft, so you can take out all of the excess air from the bottle which makes them antic colic. Of course I am a breast feeding advocate - but if that isn't for you, then you really should check these out. £9.99 each for 8oz bottle.